Very interesting letter to the editor on lung cancer, that puts things into perspective and that is often overlooked. Written by someone who also has left many comments on this site, so check it out. IPF treatment - worse than the "cure"
Here's another anecdote on a patient started on prednisone/azathioprine/NAC for IPF. He was started on this for a variety of reasons, but one was that the biopsy had a bit more inflammatory changes even though there was ample fibroblastic foci and heterogeneity, so I thought a 3-6 month trial would be reasonable. By the time his imuran was up to 75 mg, I saw him. A repeat spiro was unchanged (FVC 43% predicted) but his DLCO went from 35% to 45% so I continued the meds. However he had mouth pain and the tongue showed possible thrush so I kept the Imuran at 75, gave some nystatin swish and sent him out to be followed up in 2 months and repeat the HRCT with the sprio/DLCO. 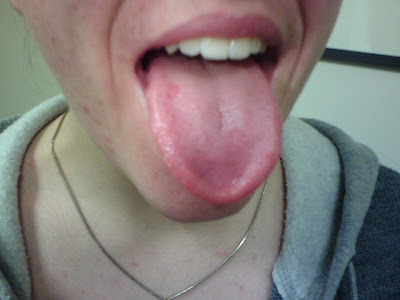 However, his mouth pain did not go away and worsened, and he started developing malaise and a fever. I saw him in clinic that day. He looked fairly sick but vitals ok. He had a soft palate lesion. I got derm to KOH it and there are some non-budding hyphae so he's to get clotrimazole . Then almost as an afterthought I added on amylase and lipase to the repeat LFT's and low and behold the lipase is 800. This side effect is likely going to be self-limiting as he stays off the imuran. As I tell him to go light on PO intake, I am adding a creatinine to make sure he is not volume depleted (he's an outpatient). One of our CT surgeons has been using Precedex for postop sedation for vent patients with good success. according to information in that article, it appears to be a very attractive option. It is a short-acting alfa2 agonist and you do not have to discontinue this before, during or after extubation because it does not cause respiratory depression. Are many intensivists already using this in medical ICU? 18 year old man migrated from Thailand in 2005. 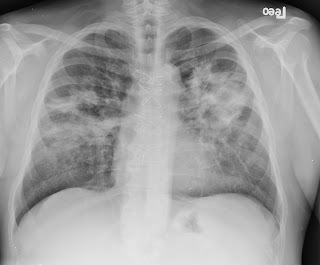 Father in 2004-2205 had active pulmonary TB, treated for six months with standard regimen and responded. Patient does not recall whether he had PPD done then or not and was not treated for LTBI. 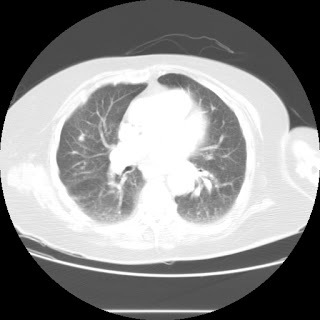 Now is asymptomatic but CXR done for other reasons was abnormal.chest CT shows 5 very small (largest is 2.5 mm) scattered nodules. sputum AFBs are negative including cultures. current PPD negative and quantiferon test negative as well. Physical exam unrevealing. 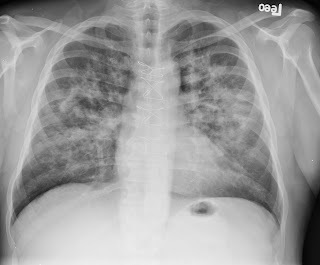 would you treat for latent TB given exposure? 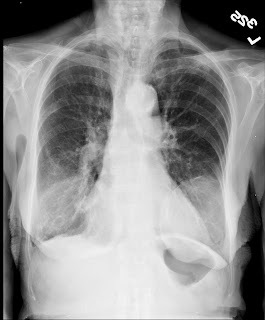 This is the 64-year-old man with progressive, worsening dyspnea described below. Initial blood cultures and sputum culture were non-revealing. His ESR was 75 with a positive ANA screen but essentially negative titers (<1:40); U/A was unimpressive, renal function was normal, initial CBC had mild anemia (Hgb 12.6) but normal WBC (7.6 with 90% PMNs) and normal platelets. What other tests/info would you like next? This is a very pleasant, 64-year-old man with progressive worseningdyspnea over the past couple of months. He states that up until maybe six months ago he had been in his usual state of health and had no persistentdyspnea. For the past 3-4 months he has had insidious onset of dyspnea on exertion, which has been worsening. He has had no associated cough, no chest pain, no fever, no chills and no night sweats. He denies any significant paroxysmal nocturnal dyspnea, though he does have some component of orthopnea. He has never had hemoptysis. His weight has been stable. He actually has gained some weight in the past couple of years. He has had no previous label of severe chronic lung disease. 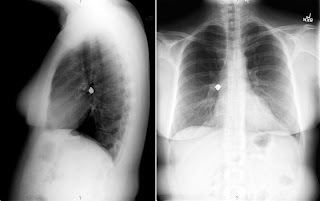 SOCIAL HISTORY: He used to smoke, but quit about 15 years ago when he was diagnosed with the mediastinal and hilar adenopathy. He worked in freight mostly at docks and driving transport. No alcohol abuse, no illicit drug use. He used to live in Mississippi (now here in TN). He has no exposure to sick contacts. He lives with his wife and they have no pets. No alcohol abuse, no illicit drug use. FAMILY HISTORY: Is remarkable for his sister having pulmonary fibrosis, but we are not sure as to what type. She apparently is on oxygen 24/7. REVIEW OF SYSTEMS is otherwise fairly unremarkable. PHYSICAL EXAMINATION: Afebrile. Only pertinent positives are some faint right basilar crackles which actually cleared withcough. He has slightly diminished breath sounds at the bases. I could not appreciate any wheezing. He has no edema, no clubbing and no cyanosis. 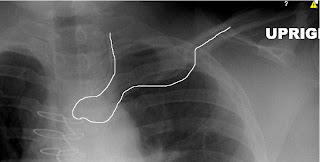 CxR and CT as below. What do you think and how would you work him up? The case below was posted last week. Since that time I obtained a high res CT and autoimmune panel. The ANCA and ANA were normal. The BAL (clear non-bloody) was negative for any infection. The cell count of about 500 was predominantly macrophages. He is still short of breath (mostly on exertion but to a lesser extent at rest). He has no fevers or other constitutional symptoms. No more hemoptysis. 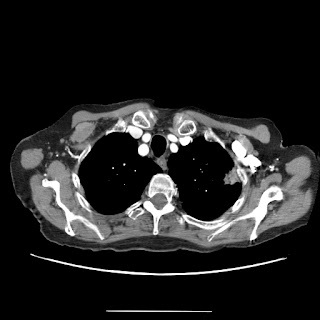 63 year old man with one week of hemoptysis. The hemoptysis is described as streaks of blood with the underlying sputum being slighltly light green or white. No malaise. Just some shortness of breath. No fevers or night sweats. No anorexia or weight loss. He feels pretty well except for the mild increase in SOB. He is a 48 pack year smoker now quit. No significant exposure or travel history. For what its worth (if anything), he was cleaning out his gutters about a week before the symptoms. Lots of decayed leaves etc. On exam he is WNWD and NAD. Vitals and pulsox are normal. No LAD and the lungs are clear to auscultation. His WBC is 14 and in June it was 7. 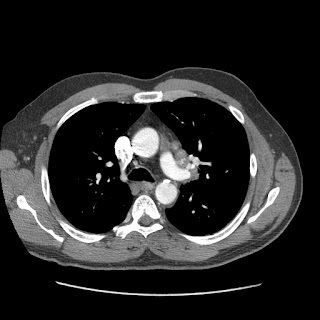 He has persistent dyspnea despite a course of azithro for presumed mycoplasma. The BAL was negative for virus or fungi. 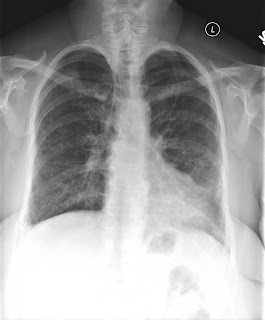 What is your differential dx? What are your opinions regarding the use of adjuvant steroids for presumed TB pericarditis? 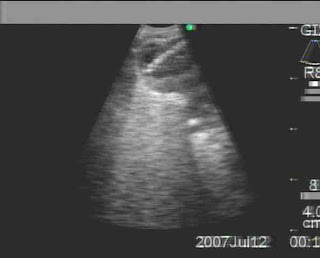 Do you think a pericardial biopsy is a must if we have a positive PPD, negative cytology of fluid, low glucose on fluid studies, and good clinical history? Thanks. 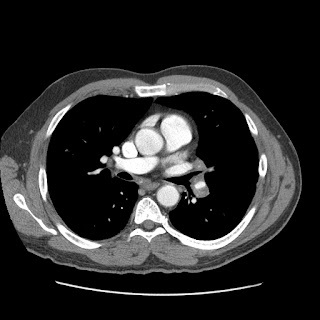 65-year-old woman presented initially for evaluation of shortness of breath. 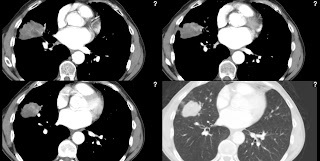 A CT thorax revealed some patchy airspace opacification RUL (see below) . She underwent bronchoscopic evaluation and it demonstrated some interstitial inflammation with hyperplastic type 2 pneumoctyes. No granulomas seen. No fungal or AFB elements on BAL. A cell count was not sent. 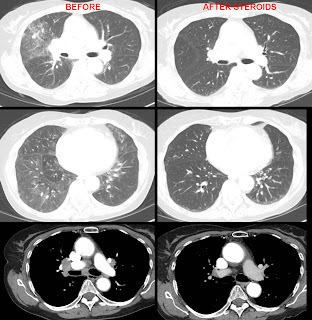 She was begun on a course of steroids 40mg and felt her breathing improved significantly while on them, but once she stopped them, her shortness of breath recurred. Her cough has also recurred, though it's mostly non-productive. 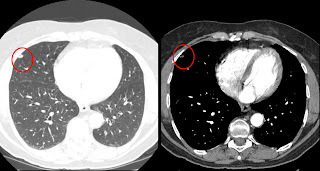 A CT was repeated 5 monts later and is shown below. 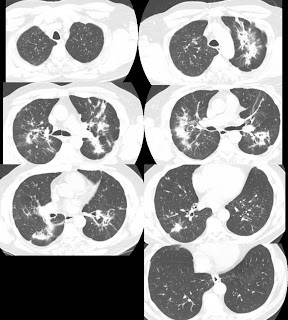 Question: What ILD had adenopathy and is steroid responsive? The only 2 I can think of are sarcoid and berrylliosis, but the interstial inflammation would be inconsistent with that. Any thoughts out there? C/A/P showing prevascular lymph nodes with some calcifications and left hilar borderline enlarged lymph nodes, and a renal cyst not further characterized on that study. DDx included subacute cerebellar degeneration and progressive supranuclear palsy. These are the EBUS images from the bronch including and the core biopsy from the TBNA. The answer was that these little lymph nodes were small cell carcinoma. The special stain is a cytokeratin stain of the malignant cells. 60 year old woman with sarcoidosis by mediastinal biopsy 1978 doing well, never requiring steroids. 2 mos prior developed SOB - smothering type of feeling even at rest but also on exertion. 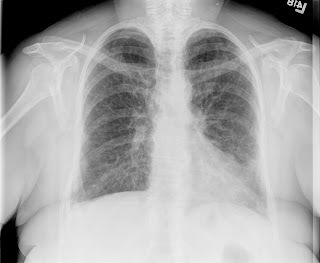 A CXR during a routine physical showed a left paralyzed hemidiaphragm. NQWMI 1991 Echo on f/u showed torn chordae and LV "contractile abnormality" on a thallium test. "I am 60 y/o and live a quiet life but my legs are now getting weak and I am unable to bend down in a sitting position and get up. I failed to mention that I had a lumbar puncture which was normal. MRI showed cervical problems but nothing serious I guess. The pons area of my brain showed vascular changes due to aging. I also had strabismus during all of this and had a prism put in my glasses because of a convergence problem with my eyes. Could this all be connected? Myasthenia gravis I guess has been ruled out and they are calling this idiopathic phrenic nerve paralysis. Should I pursue this any further?I have about 40% function of my left lung." Note: please consider adding a comment to help keep this blog going! Hi I have been looking at this blog for since 2005 on a weekly basis and wonder if you take questions from patients. Your site is informative it is a pity you are not getting the hits. I am a 38yo M and I have a chronic symptoms now for many years with NO DIAGNOSIS despite pressing for one. I have a hacking cough with some sputum in the morning, I also have nearly constant SOB with an inability to get a deep breath. A feeling of stiffness in my lungs. I feel constantly like my breathing is not good. This has been with me since 2003. Excercise tolerance is ok i.e. I could run a mile in 10min but I struggle to breathe throughout. 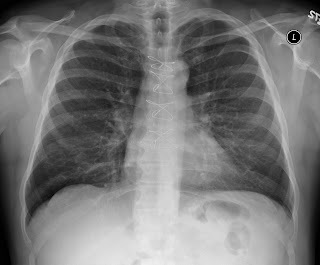 Pleurisy type pain on and off weekly, specifically located in same location at upper left back. Lower rib pain on left. Asthma as a child, allergic rhinitis as a teenager and young adult, smoked in college (10 a day) and socially (30 at weekend) till I was 33. On and off asthma meds since 1994. Tried Singulair, Symbicort, Spiriva etc. Tried also extensive courses of Zoton, Nasocort etc. Have been evaluated many times over the years by 3 pulmos spent '000$ and the best they can give me as a diagnosis is " a chronic inflammation similar to chronic bronchitis with little or no asthma but we are reluctant to give it a title "
Why do I have symptoms if all tests are normal. What do you guys think.. have you seen this before, normal tests but chronic symptoms with dyspnea. Has anyone else heard that Astra Zeneca will be discontinuing pulmicort? Were they not making a profit on this? Anecdotally, I see a lot of patients on Pulmicort. NDA 20-441, PULMICORT TURBUHALER 200 mcg (budesonide inhalation powder) will no longer be available at AstraZeneca. The introduction of PULMICORT FLEXHALER (budesonide inhalation powder, 90 & 180 mcg), NDA 21-949, will be accompanied by the phasing out of PULMICORT TURBUHALER so as to minimize confusion in the marketplace. AstraZeneca has no further plans to manufacture NDA 20-441, PULMICORT TURBUHALER 200 mcg (budesonide inhalation powder). 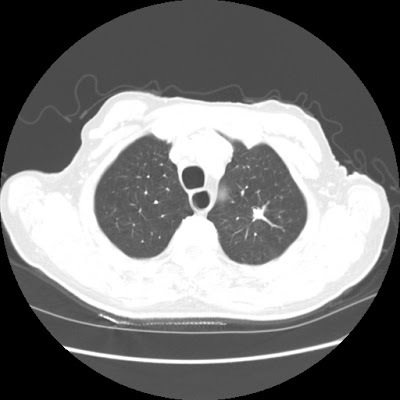 71 year olf woman with idiopathic pulmonary fibrosis diagnosed by open lung 2004 (UIP on biopsy). Since that time she has been stable with good exercise tolerance, and able to get around with little difficulty. PFT's also stable during that time frame with FVC in low 80% since 2004. Over the last 2 months she reports increased dyspnea on exertion and fatigue. Her ambulation has decreased over the last 3 or 4 months because of pain of her left hip, which for the last 6 months she had been getting injections for. She is due to get left total hip replacement. She has difficulty getting out of the chair because of pain in her hip. She does still try to get around, but her ambulation she does admit has decreased over the last 3 months because of this pain. She denies any nocturnal shortness of breath or orthopnea. She has no chest pain. There is no fevers, chills, night sweats. No appreciable weight gain subjectively. No anorexia. No cough. Her physical exam is a pleasant woman sitting in a chair, in no acute distress. Blood pressure 123/59, pulse is 77, respiration is 20, O2 sat is 97% on room air, her weight is 228 pounds. Her weight in March 21st on another scale at another clinic was 221 pounds and her weight on our scale in January 2007 was 231 pounds. HEENT: Trachea midline, no lymphadenopathy. The JVP seems to be about 4 to 5 cm. The lungs have crackles basilarly and laterally about the third of the way up. Heart is regular rate and rhythm with a positive S3, no murmurs or rubs. Abdomen: Benign. There is trace pitting edema bilaterally at the ankles. Spirometry shows the ratio of 84%. FEV1 of 1.87 (83% of predicted), FVC of 2.21 (74% of predicted). DLCO 65% of predicted. In May 2006 FVC was 80% of predicted and DLCO 74% of predicted. What are your thoughts and/or what would you do next? It's size is about 7 mm. Of note, the CT slices were 7 mm. This nice woman with mild asthma lost a tooth crown and aspirated it as she was about to have lunch. 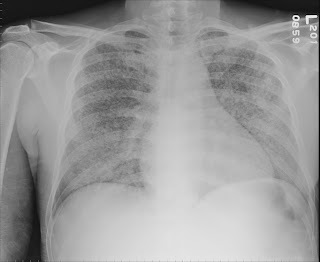 Check out the CxR. It was lodged at the first branching of the R bronchus intermedius with the smooth side (the shiny top of the crown) up towards us. Unfortunately I was using an optic (as opposed to digital, I know they are all "optic") scope and couldn't take a picture. I did snap a picture of the crown after removal with the basket on the side. We did not have a bronch basket handy so an OR gallstone basket was just the perfect sixe. A few years ago, Fagon et al published a large trial of BAL for evaluation of VAP in over 400 ICU patients in France. Compared to a noninvasive strategy, an invasive strategy was significantly associated with fewer deaths at 14 days, earlier attenuation of organ dysfunction, and less antibiotic use in patients suspected of having ventilator-associated pneumonia. Recently a trial was published on the NEJM comparing quantitative BAL to endotracheal aspiration with nonquantitative culture of the aspirate. They found no significant difference in the primary outcome (28-day mortality rate), the rates of targeted therapy, days alive without antibiotics, maximum organ-dysfunction scores, length of stay in the ICU or hospital. What is your routine practice in the ICU for VAP? Do you bronch everybody with suspected VAP? (Dr. Kollef had an interesting editorial on the Canadian trial in the same issue of the NEJM). The TORCH trial is the lead article on today's NEJM. No statistically significant change in mortality with Advair but reduced annual rate of exacerbations and improved health status and spirometric values. There was also an increase in pneumonias in the fluticasone-treated groups (FP alone or Advair). How do you think this data will affect your prescribing patterns for ICS in COPD? I had posted a long time ago on sedation for bronchs and our preference for propofol. I am at a new hospital and looking to implement a similar protocol (propofol is now generic and much cheaper than a Versed/opiate combo) and in my experience provides more predictable and reliable sedation. 1. Have you used propofol for bronchs? 2. If not what is your default? 1: Acta Anaesthesiol Scand. 2003 Apr;47(4):411-5. 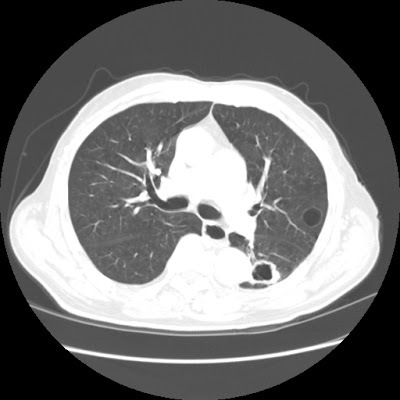 Should patients undergoing a bronchoscopy be sedated? Gonzalez R, De-La-Rosa-Ramirez I, Maldonado-Hernandez A, Dominguez-Cherit G.
2: Anasthesiol Intensivmed Notfallmed Schmerzther. 2004 Oct;39(10):597-602. Sedation for fiberoptic bronchoscopy: fewer adverse cardiovascular effects with propofol than with midazolam. Ozturk T, Cakan A, Gulerce G, Olgac G, Deren S, Ozsoz A. 3: Anesth Analg. 2002 May;94(5):1212-6, table of contents. 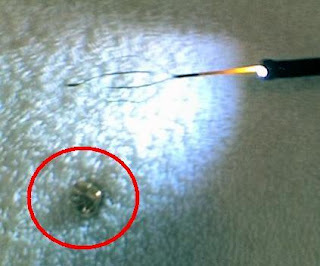 Target-controlled versus manually-controlled infusion of propofol for direct laryngoscopy and bronchoscopy. Passot S, Servin F, Allary R, Pascal J, Prades JM, Auboyer C, Molliex S.
The Cochrane database recently published this review on allergy shots for rhinitis. They retrieved 1111 publications of which 51 satisfied their inclusion criteria (looking for RCTs with placebo-control) and in total there were 2871 participants (1645 active, 1226 placebo), each receiving on average 18 injections. Duration of immunotherapy varied from three days to three years. Symptom score data from 15 trials were suitable for meta-analysis and showed an overall reduction in the immunotherapy group and medication score data from 13 trials also showed an overall reduction in the immunotherapy group. It is good to see some good quality data on that. However, I was amazed by the number of shots. Where I was in practice patients would be on weekly or monthly shots for 3, 4, 7 years and would be way over these limited numbers. What has your experience been with allergy shots? 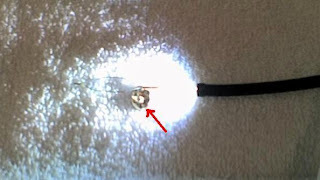 Here is a submission from John B: It is interesting that it is close to the very first post of this blog. I continually test a low (60% I think) DLCO on a PFT. All other parts of that test are normal. I have dizziness, lightheadedness, sob (random- at rest or exertion). Palpitations at times, but not nearly as often as in the past. Occasional feeling of pressure in chest. Echo was normal, but imo it looks like values have been increasing over the past 2 years- still in normal ranges, but I do show some trace/mild tricuspid regurg and trace mitral regurg. Two times I have done a cardiopulmonary stress test, and both times it shows a cardiovascular limitation evidenced by crossing of the anaerobic threshold earlier than I should- metabolic acidosis after exertion. 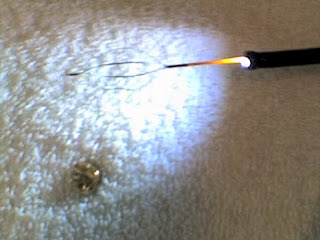 Nuclear stress test shows no blockages. Also, my own testing with a pulse oximeter seems to indicate occasional drops in my O2 to as low as 92, but then quickly recovering to 96-98. This has never happened in doctor's office with their oximeters, so I don't know if mine is accurate (however, when testing my wife as a control subject, she always shows 96-98). No one knows what to make of this. I was thinking of requesting a stress echo, to see if there is more regurgitation after exercise. Any other tests I should have done? Would really appreciate some assistance. I can provide more specific data if needed. We are re-vamping our group's chest tube standard orders and I was wondering how people like their chest tubes handled. 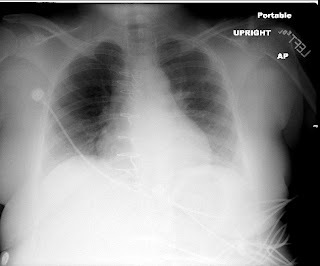 What do you use for sedation/pre-medication for a non-emergent chest tube placement? How often do you like the dressing changed? What do you tell the nursing staff to do in case of CTs accidentally coming out? This is more of a critical care (or general care, if you will) than true pulmonary. I have been seen a lot of docs (including some ID) treating uncomplicated C. diff colitis with PO vanco up front instead of Flagyl. Have recommendations changed? Do you use much PO vanco? Following Jeff's question on therapy for lung Ca in octogenarian (see post below) I just saw a patient in a similar situation. This is an 85 y/o woman with a recent spiro revealing an FEV1 of 600 ml. She was just diagnosed with a 2-cm LUL adenoCa with no adenopathy and no other distant disease on PET. She is still fairly active but stated that even if her lung function improved, she would not want surgery. With such a low FEV1 and with some risk of further loss of function with radiation, what would you suggest? And following on JJ's question, what are your alternatives for octogenarians (or anybody else) who can't or won't have surgery?